Be the first to share your favorite memory, photo or story of Margaret. This memorial page is dedicated for family, friends and future generations to celebrate the life of their loved one. 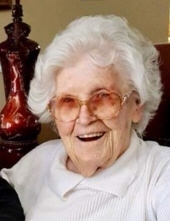 Margaret Helen Craven Meredith from Elkins, WV went to paradise to be with the Lord on Tuesday, November 27, 2018. She was born March 26, 1929, in Upshur County, a daughter of the late Morris Craven and Beulah Tenney Craven. On February 3, 1949, she married Edward Russell “Russ” Meredith who preceded her in death on December 17, 1973. Surviving are a son, Edward “Eddie” (Cathy) Meredith, Jr. of Bentleyville, PA and a daughter Jan Meredith (Chuck) White of Fayetteville, GA; five grandchildren: Beth Robertson, Lisa (Alan) Eimer, Lori (Judd) Ashby, Michelle (Kevin) Albert, and Jennifer (Jared) Williams and two step-grandchildren. Five great grandchildren: Tara Eimer, Meredith and Corbin Ashby, Devon and Olivia Albert and 8 step-great grandchildren and one step great-great grandchild; two sisters Betty Strader of Buckhannon, and Lorietta (Stanley) Tenney of Tallmansville; plus several nieces, nephews, and cousins. Deceased in addition to her husband and parents are one sister Lucille (Buck) Armstrong and one nephew. Mrs. Meredith attended schools in Upshur County and took classes at Davis & Elkins College. She worked for the U.S. Forest Service for over 35 years and retired in 1990. She was an active community worker, a member of the First Baptist Church for over 50 years, the Woman’s Club of Elkins, Davis & Elkins College Aid, Regent for the John Hart Chapter Daughters of American Revolution, Davis Memorial Hospital Auxiliary for over 30 years doing volunteer work at the hospital, Randolph Co. Senior Center, AARP doing income taxes for Seniors for over 15 years, charter member of the local chapter of National Association of Retired Federal Employees, and co-founder of the Monongahela National Forest Retirees Association. She was previously a member of the Directors of the American Cancer Society, Cub Scout Den Mother, Girl Scout Leader, and active in school auxiliaries and church activities. She held various offices in most organizations she belonged to. She and her husband served for five years as Leaders of the Baptist Youth Fellowship including roller skating in the church gym. She loved reading and traveling to different parts of this country and overseas. She was continually working on Family Genealogy and presented copies to her family. She also gathered material for the history of the First Baptist Church. The family will receive friends at the Lohr & Barb Funeral Home of Elkins on Saturday, December 1, 2018 from 9:30AM until 12 Noon the funeral hour. Pastor L. Scott Hamby will officiate and interment will follow at the Maplewood Cemetery at Elkins. The family requests that in lieu of flowers, contributions be made to the Russell Meredith Memorial Trust Fund at First Baptist Church, 412 Randolph Ave, Elkins, WV 26241. This Trust was established so that the interest would quietly help those with a one-time need. To send flowers or a remembrance gift to the family of Margaret Helen Meredith, please visit our Tribute Store. "Email Address" would like to share the life celebration of Margaret Helen Meredith. Click on the "link" to go to share a favorite memory or leave a condolence message for the family.